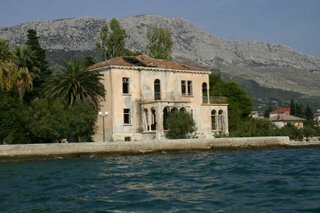 As some readers will be aware, letting your property in Croatia can be a legal, tax and bureaucratic minefield. Martin Westby of Croatia Property and Home is looking for those who have been at the sharp end of the letting process who might be prepared to participate in a Channel 4 program highlighting property problems in Croatia. Hopefully, the program will at least ensure some probing questions are asked of the right people, raise general awareness and perhaps get things moving a little bit in favour of property owners! Martin is the author of a book on purchasing property in Croatia and has also produced a booklet, available in PDF form from his website, on the ins and outs of letting. It’s probably the most practical and detailed guide you will be able to find and is the result of Martin’s considerable experience in all aspects of Croatian property dealings. For our earlier postings on property, including our initial review of Martin’s publication and other news, follow the links below to go directly to the relevant page. Permission For Foreigners to Buy a Croatian Property - Long Waits? Looking back to Croatia Online’s very first posting on property (the last link listed above), written in February this year, it’s interesting to reflect that not much seems to have changed in the property market and some might consider that purchasing is more difficult than before. Many of the town councils have yet to release their long term plans and there still remains a lot of confusion as to what can be built where. The second link is to a posting that suggests the process for foreigners getting permission to buy may be speeded up but we’ve yet to hear of the reality of the situation. However, whatever the complications, all of the people we know who have bought might not want to go through the process again but remain highly delighted with the end result. It’s easy to get used to living here and taking things for granted, but you only have to entertain a first time visitor to Croatia to remind yourself what a special place it is. And finally, if you haven’t time to go through all our postings, on a variety of subjects, click on the third link on the top right of the page to get a full index of postings. Croatia Online Lifestyle - Keeping Fit! Croatia - Is it a Good Tourist Season This Year? Croatia Online - Cost of Living On The Up?